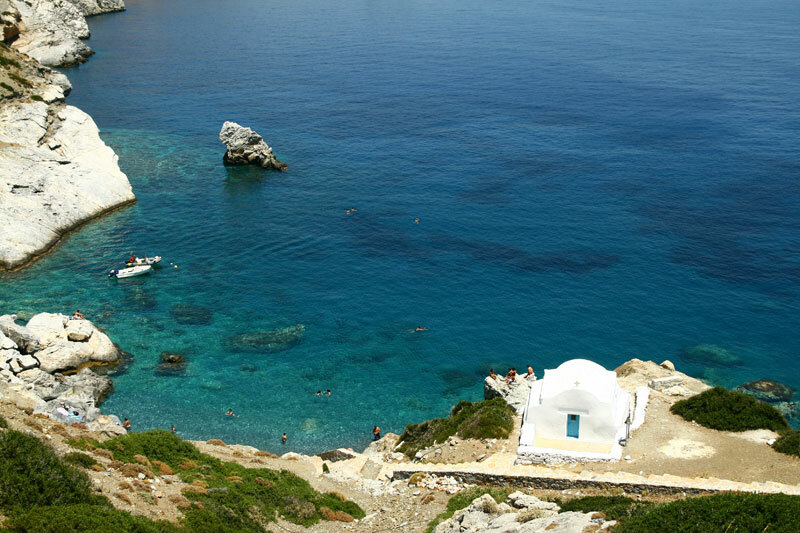 It is one of the most famous beaches of Amorgos: scenes from the film “The Big Blue” were shot here. 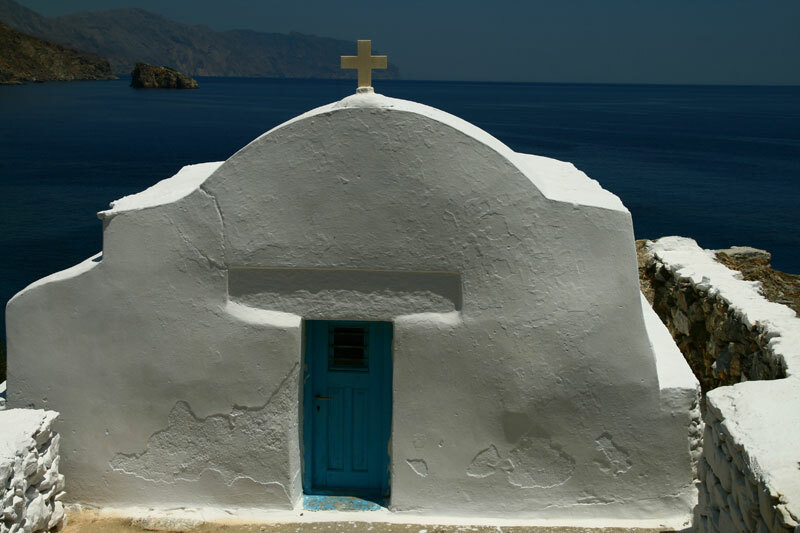 It is close to Chora and right next to the Monastery of the Chozoviotissa. The access to it is very easy. You can approach it through a stony path which begins about 100 meters above, where there is a bar and a parking space. 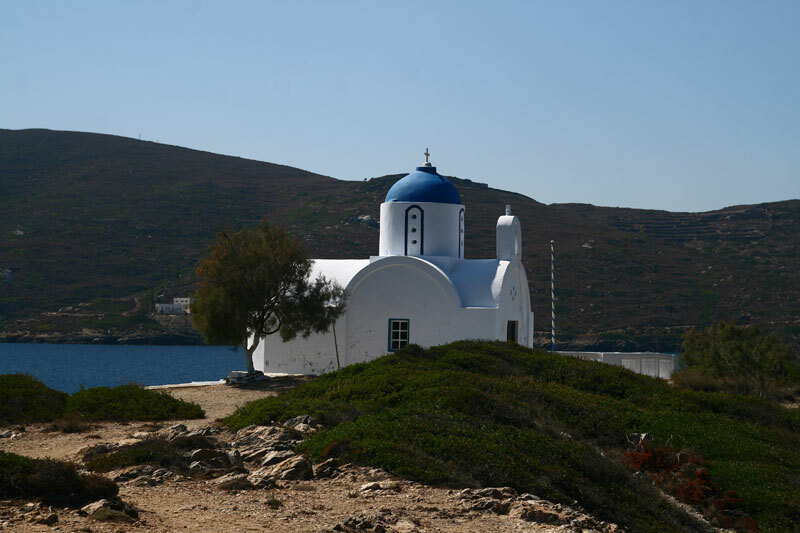 Descending on foot, you pass by the picturesque bright white chapel of St. Anne, just a few meters away from the small blue bay. 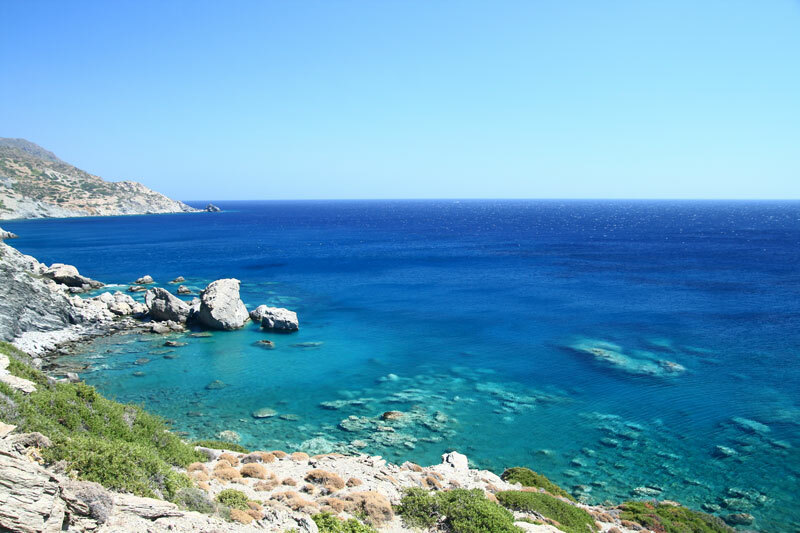 Those who love diving will love the place, because there are rocks of various heights all around in the sea. You can access the sandy beach either by boat from Katapola or by a 20-minute walk from Katapola. 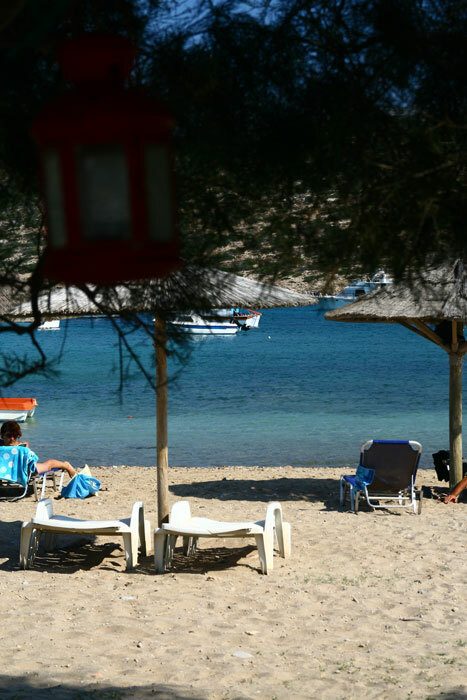 Part of the beach is organized, with a bar offering refreshments, water and cold sandwiches as well as parasols and sunbeds. 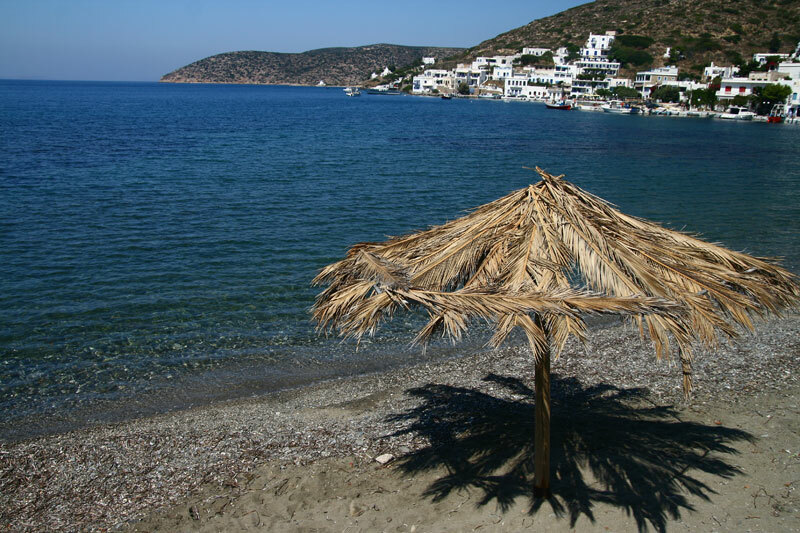 The sea here is very clean and quiet as the bay is sheltered. 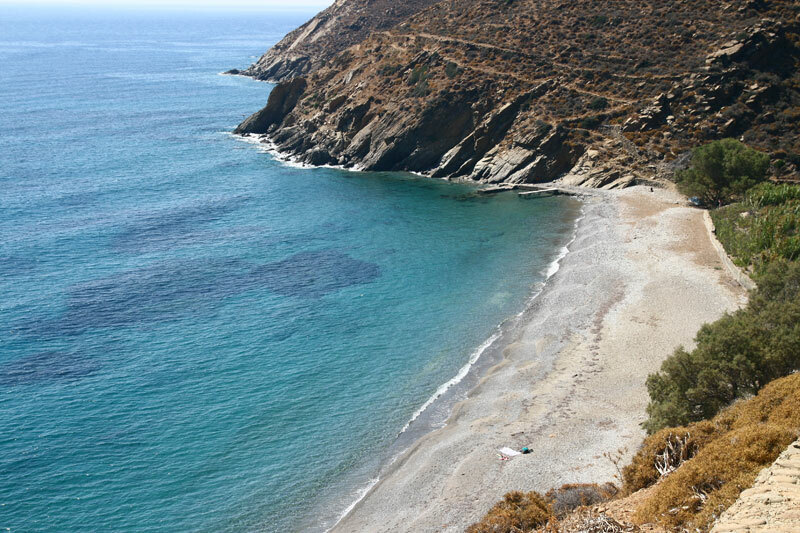 On your way from Katapola to Maltezi, following the same path, you will come across the beach of Aghios Panteleimon. 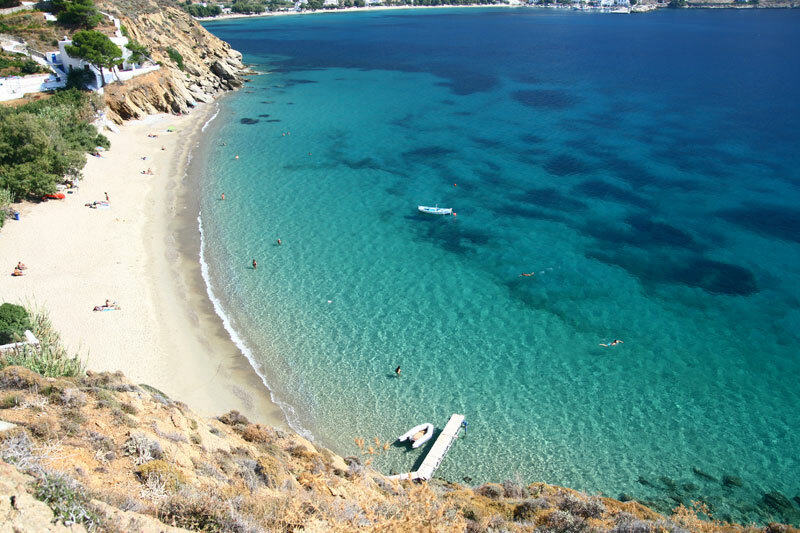 It is the first beach you will find after passing the cape with the church of Aghios Panteleimon. It is a long and narrow beach with pebbles. 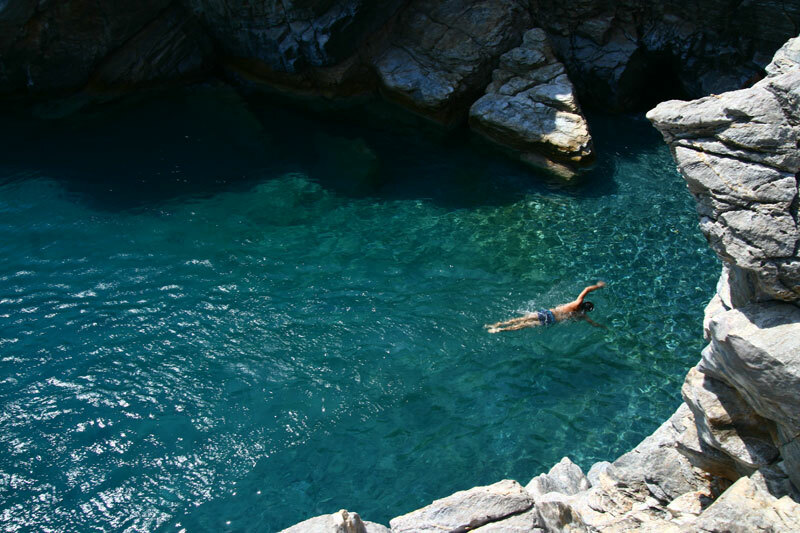 In the water there are big smooth and slippery plates of rock, so be careful! The water is green and crystal clean. The beach of Kambi is near the beach of Aghia Anna. 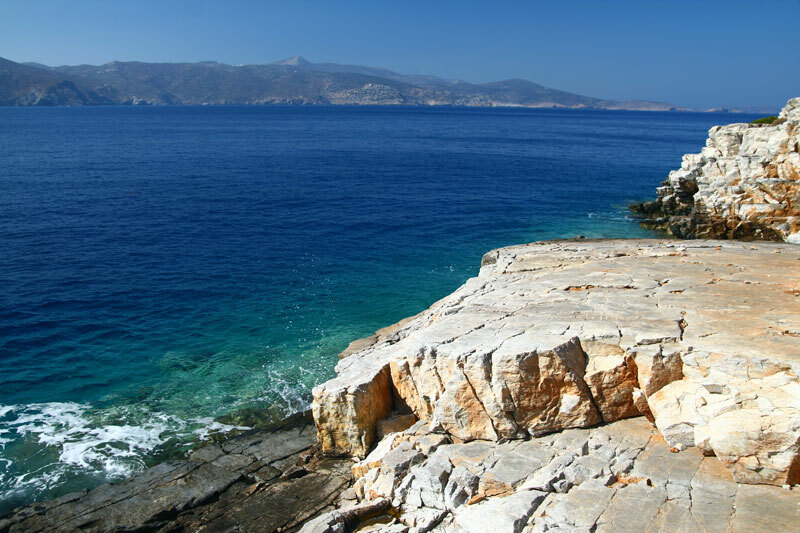 To approach it, you must descend a steep stone-built path that starts right in front of the cafeteria and the parking lot over Aghia Anna beach. After reaching the beach the path leads you to, you continue on the right path which will take you to Kambi. It is an approximately 5-minute walk and, although the beach is not visible from the hill, because there a rocks in the way that screen it from view, the access is easy. 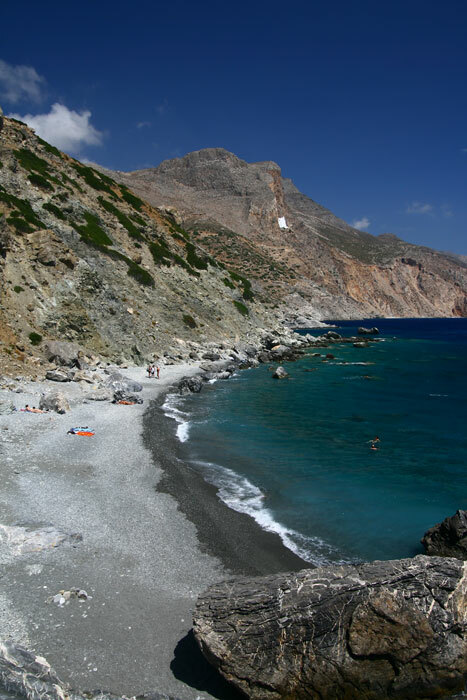 The beach has small pebbles, it is very wide and approximately 100 meters long. The water is very deep here, and it is clean and green. 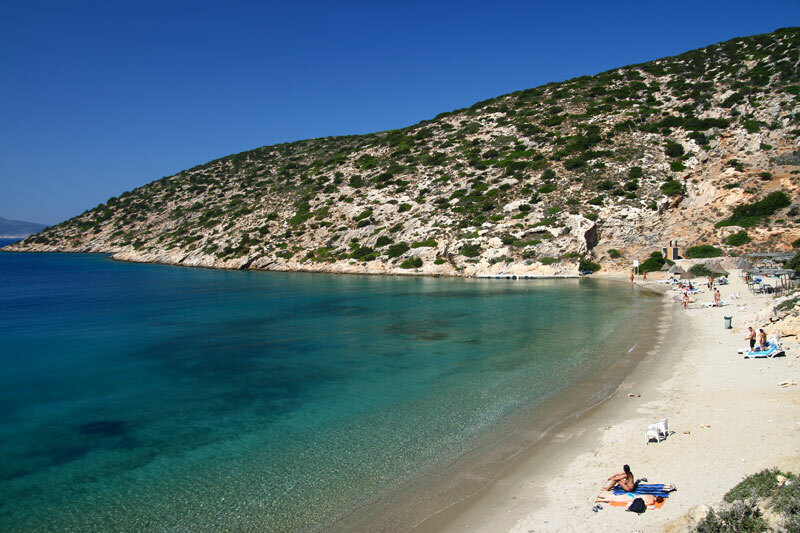 This is a beach with sand and pebbles located in the gulf of Katapola. There are umbrellas and sunbeds for the public. A small sandy beach in Katapola. The access is very easy. There are free parasols and sunbeds. 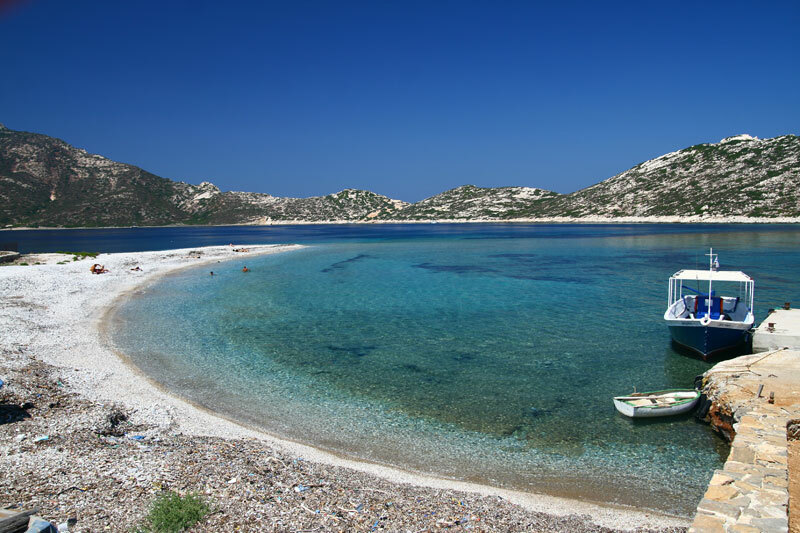 The beach is accessible only by boat from Katapola. It is a rocky beach with flat, smooth rocks. The water is very deep and clear. If you visit, don’t forget to bring your own parasol and cold water, for it’s not possible to find any here. 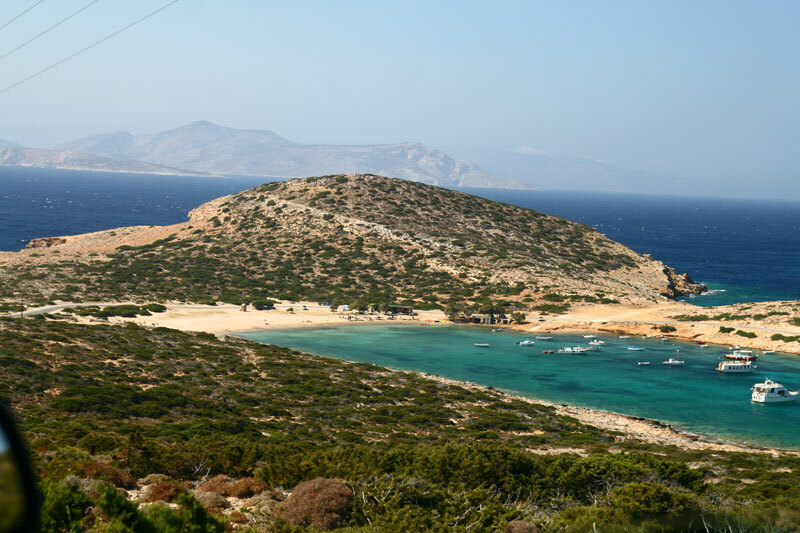 The sandy beaches are on the south of Moundoulia mountain, if you turn left on the port. 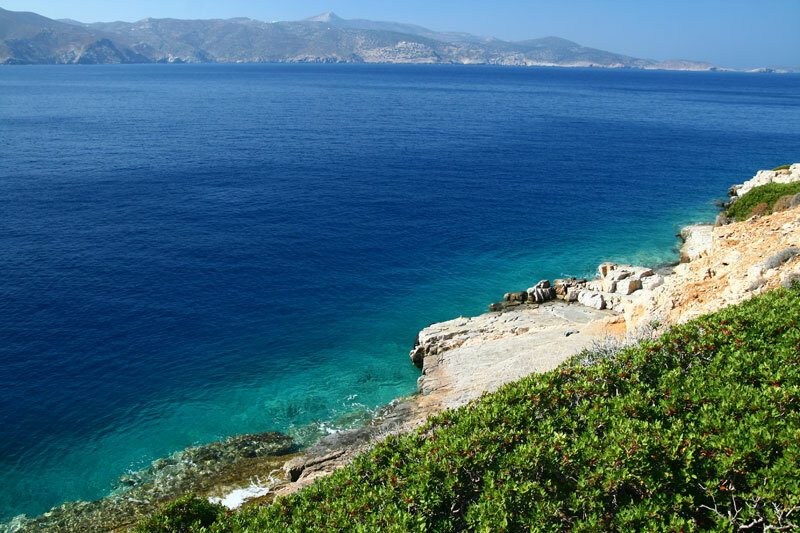 The access to Aghii Saranda, perhaps the prettiest of the three beaches, is via a dirt road (by car or motorbike) up to a point, but then you need to walk for about 10 minutes. A little before you reach Arcesine, there is a sign for Amoudi on your left. Continue for about 200 meters on the dirt road until you find the next sign that marks the path leading to the beach. You must leave your car at that point. 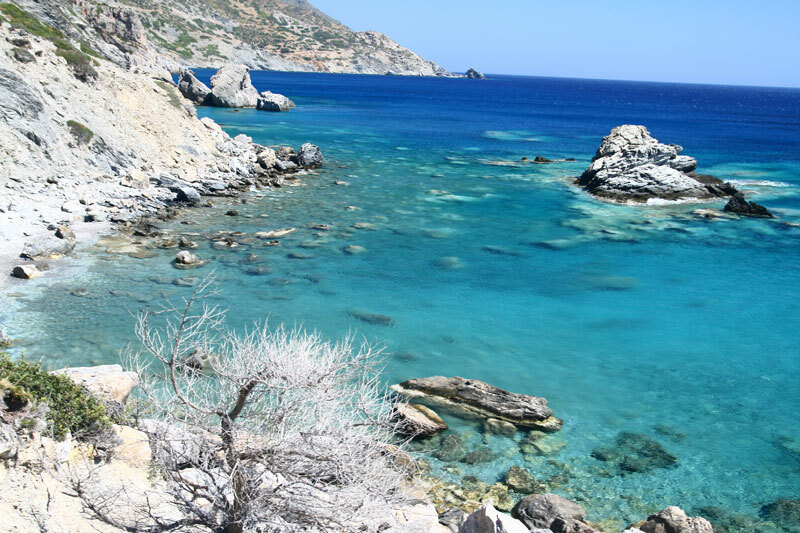 After an about 20 to 25 minutes walk on a well and visibly marked downhill path, you will arrive at the secluded and beautiful beach. There is no cafe to sell water or something to eat nearby. So it’s a good idea to take care to get what you think necessary before you go down the path. The place is recommended for fans of hiking as the landscape around the path is a beautiful wilderness. If you don’t mind carrying the weight of a mask and snorkel, you should take one with you. The water is crystal clear and blue. The bottom of the sea is ideal for discoveries, as huge volumes of rock and a lot of fish make up a uniquely beautiful underwater world. 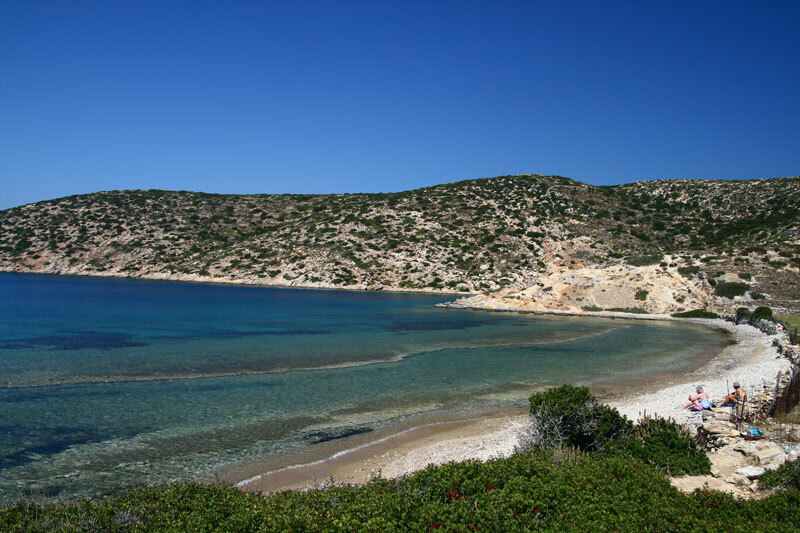 Gramvousa is a small island opposite the bay of Kalotaritissa with a long beach with small pebbles and deep waters. 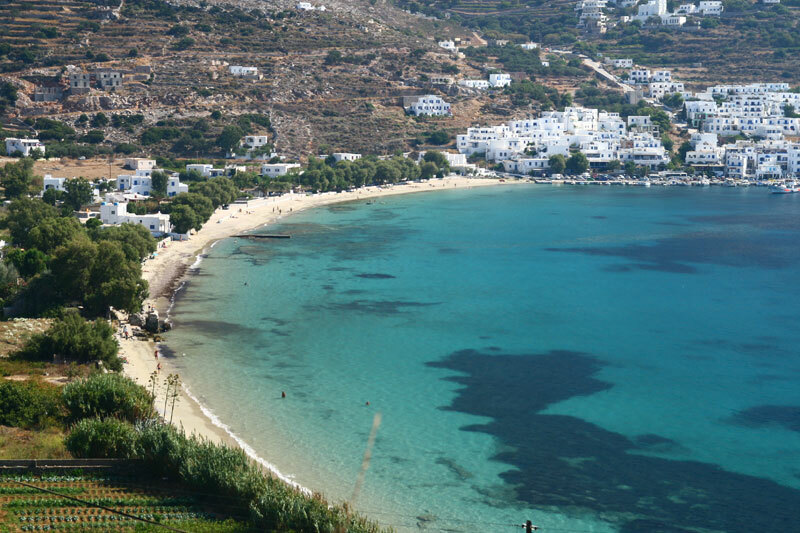 It is one of the most beautiful beaches of Amorgos. 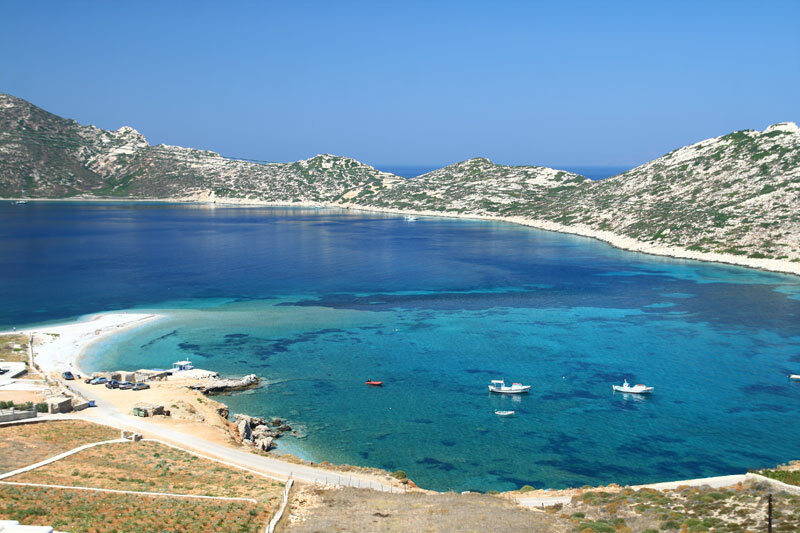 You can get there by boat from Kalotaritissa. A long sandy beach at the southern tip of the island. It is quite long and wide, and it has a bar for coffee, soft drinks and sandwiches, as well as locker rooms and a beach volley court. In front of the bar you can rent umbrellas and sunbeds. 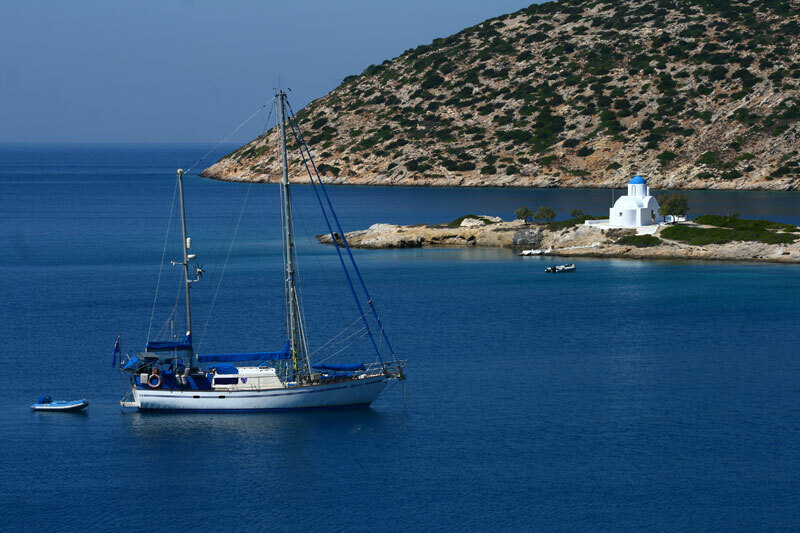 Here you can find the boat which launches for Gramvousa, the island across the sea with the beautiful beach. 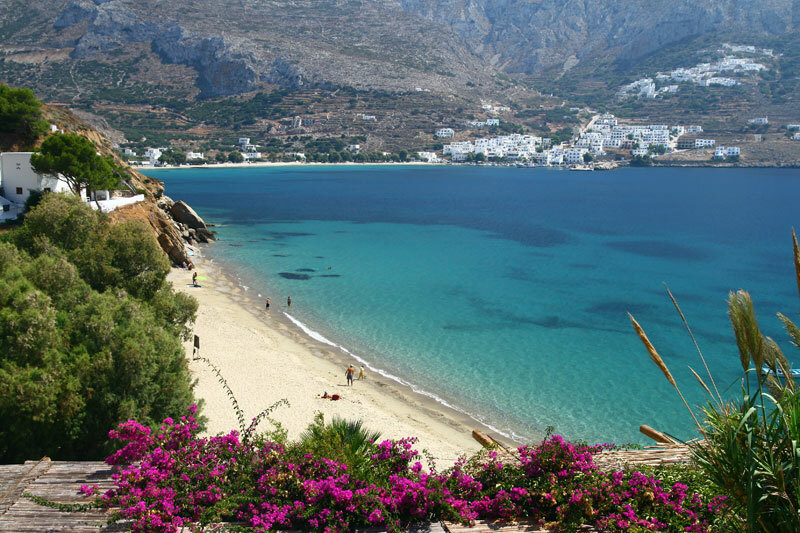 One of the most beautiful and famous beaches of Amorgos. You can access it by road, except for a very small part of the way: you must leave your car at Mouros’ parking area, where there is a tavern. 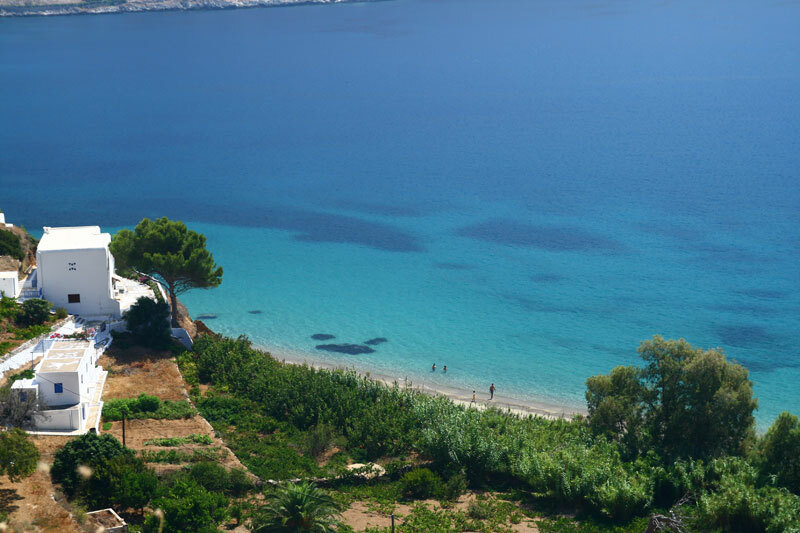 From that spot, there’s a five-minute walk down a stone-built path to the beach. 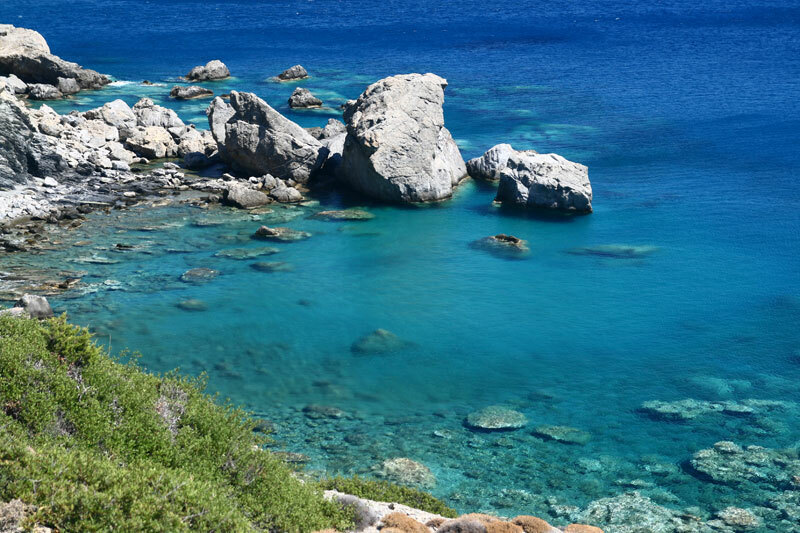 It has very small pebbles and crystal clear waters. You should definitely swim in the caves on the right side of the beach. 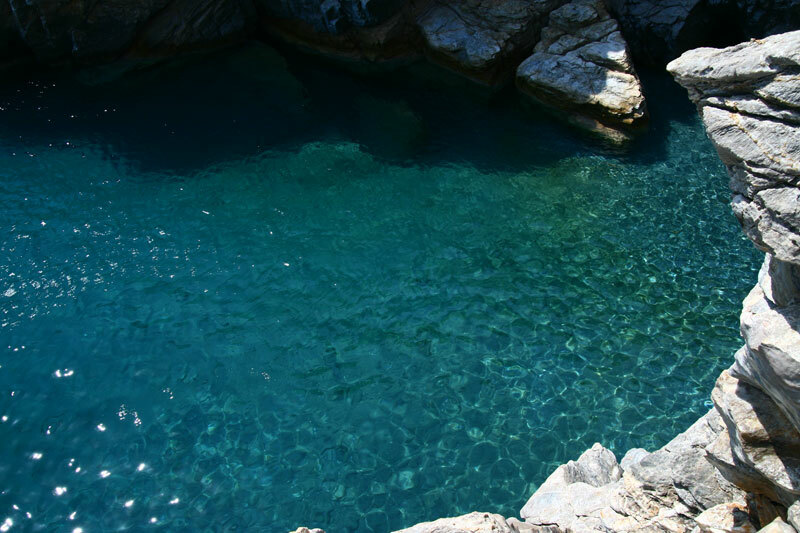 The caves are not visible from it but they are worth the swim: the distance is small, and the color of the water, a combination of the pebbles in the bottom and the reflection from the sides of the cliffs, will reward you in full. 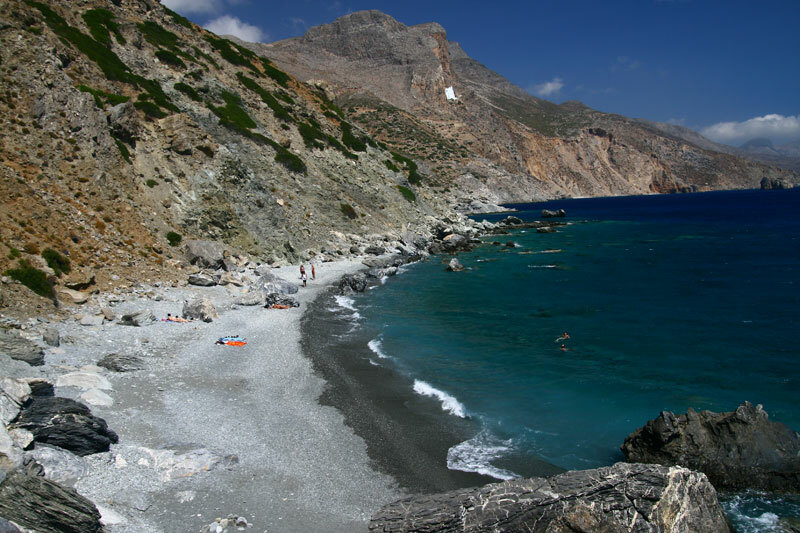 It’s one of the few sandy beaches of Amorgos. 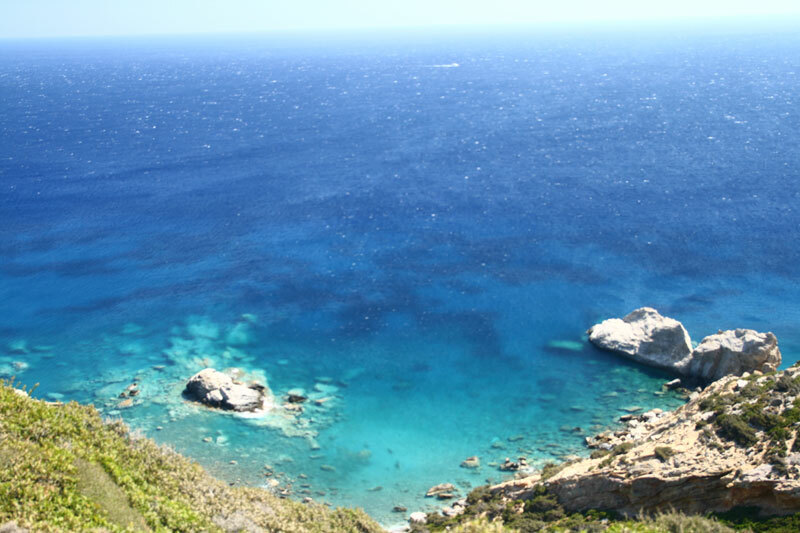 It is below the church of Aghia Paraskevi (at Kato Meria) and the access to it is easy from the road. Although not big, it is beautiful and it has a small pier on the right, which offers those who love dives the opportunity to enjoy them. 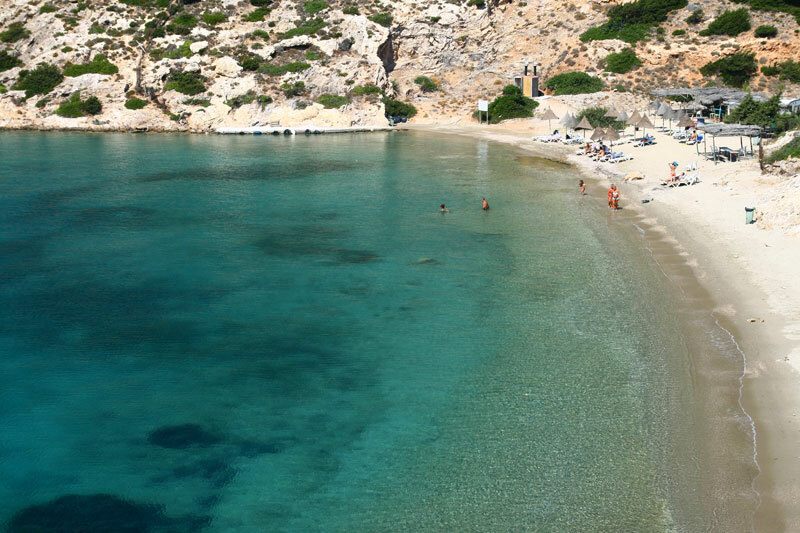 The longest beach on the island is located in Aigiali. 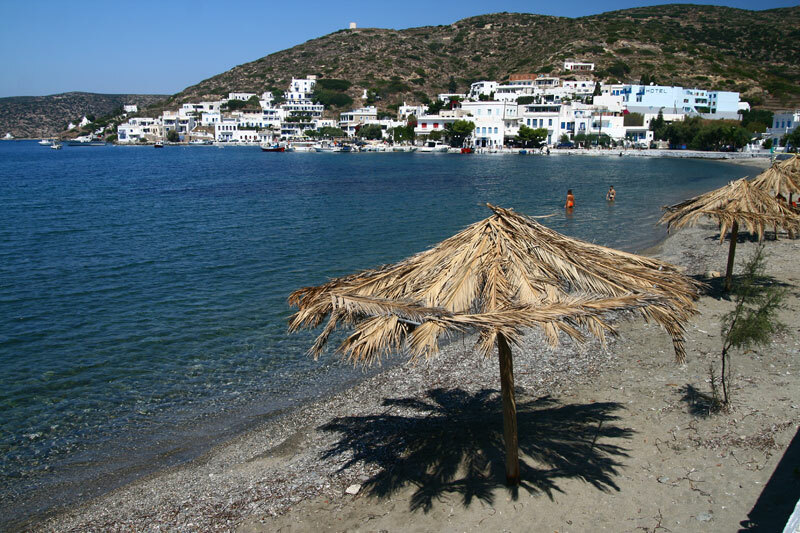 It is sandy and it spreads in front of the village’s cafes and tavernas. 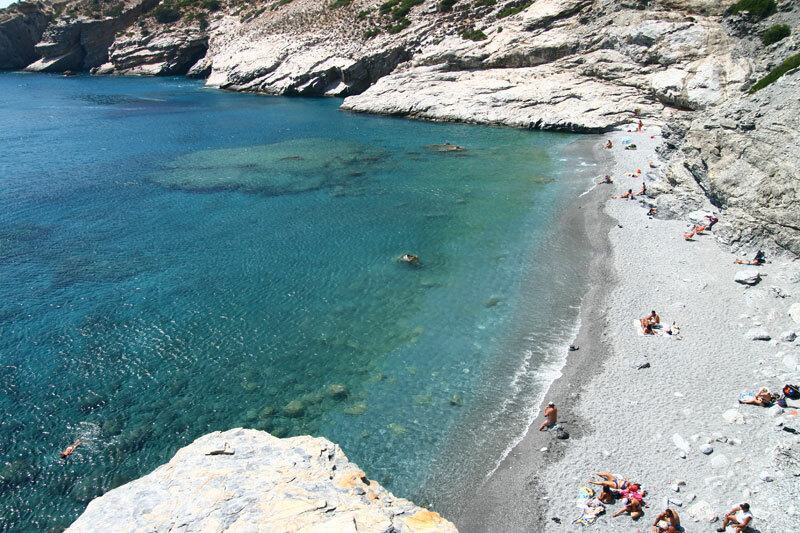 The beach of Aghios Pavlos is near Aegiali. It’s got white pebbles that give the water a bright blue color. The main feature of the beach is the tiny peninsula formed by the same white pebbles: it creates -especially from a distance- a wonderful landscape. 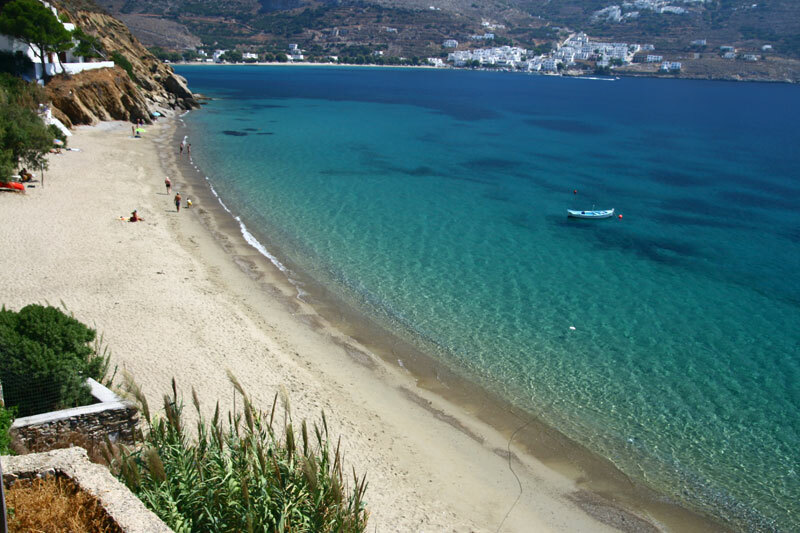 From here, boats leave for Nikouria island, located right opposite the beach, which also has three beaches. To get to Levrossos you need to drive up to a point and then take a downhill walk through the picturesque narrow streets of the settlement there. 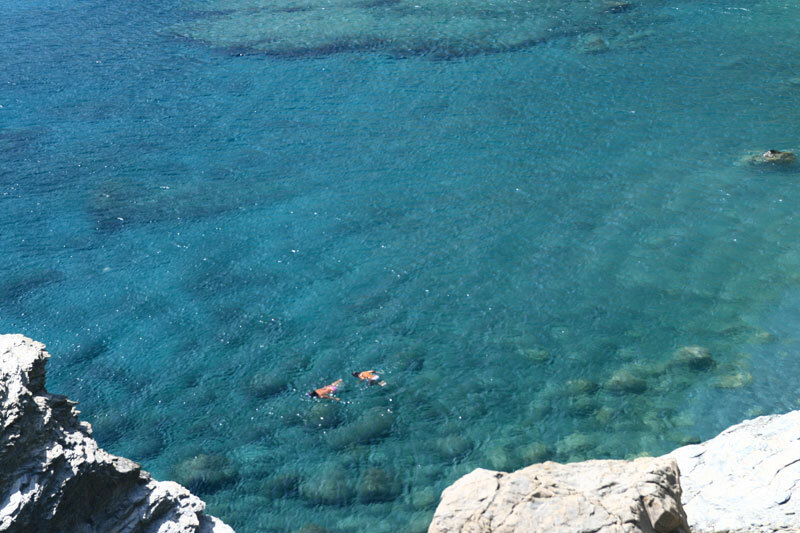 The waters are crystal clear, and the golden sand at the bottom gives them a wonderful and brilliant emerald color. This is the uninhabited islet across the sea from the area of St. Paul. 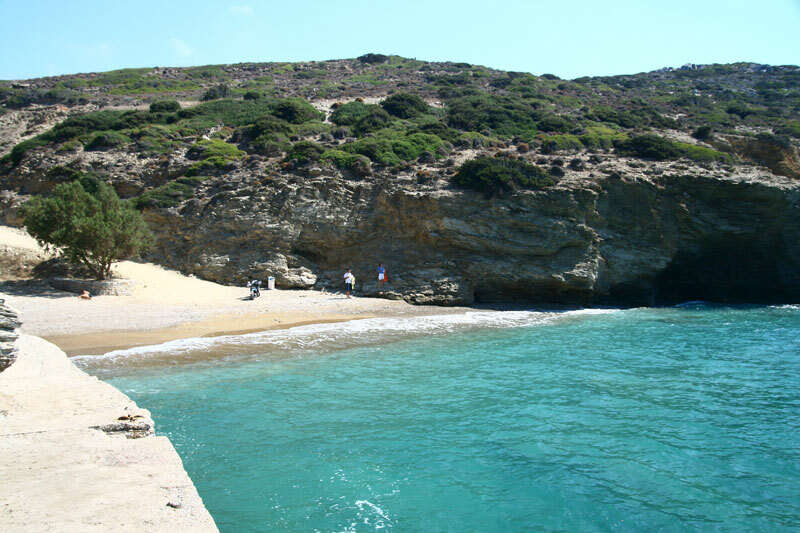 There are two lovely beaches accessible by a boat which leaves every half hour from the beach of Aghios Pavlos. 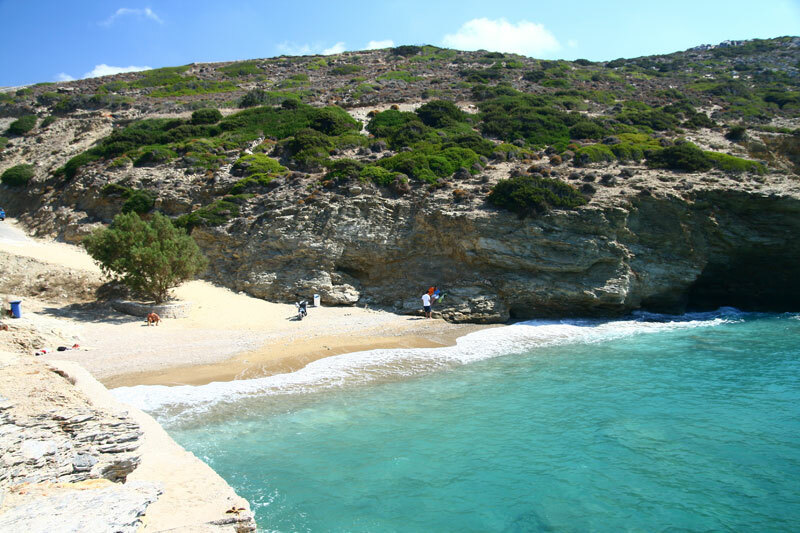 Psili Ammos is a big and somewhat secluded beach. To get there you follow the path that starts from the village of Lefrossos to the end, where a very beautiful and passable trail begins. After about 10 minutes, you will reach Psili Ammos. There is no cafe or bar, so it would be good to get a snack and some water before you go there. A few trees will give you their shade if you need it, but the waters are so beautiful you most likely won’t.